We have a new product for our shop which will soon be online. It is a toy well of all things. 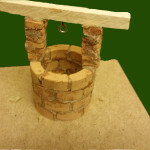 It is made using small clay bricks and a water based mortar. It is safe for all ages from 6+. If your not happy with what you have made simply soak the whole thing in water for a few hours and start again. If you spill some of the mortar. simply wipe with water. You can customize the kits to suit you and your well. It is a perfect gift for those small and big kids. Please check out our website for more information of these great kits.